Lock in a great price for Kimpton EPIC Hotel – rated 8.4 by recent guests! Did not take breakfast at the hotel. The location is good. THE BEST customer service, extremely clean, and gorgeous location. For a relaxing weekend OR for celebrating a special event in Miami. We keep coming back. I love the atmosphere , it was very stylish . The staff was very friendly and helpful with any questions I had . Loved the cleanliness ! I liked everything location, view, room, cleanliness. When there was a problem with the first room, we were moved to a new room with in an hour. They took my concerns seriously and did everything possible to rectify the situation. The views were nice, room was good, shower clean. Pics are view from the room. The wine happy hour in the lobby from 5 - 6 p.m daily was very nice. The hotel was nicely appointed. Lovely bathroom in my room. Room balcony was enjoyable. Kimpton EPIC Hotel This rating is a reflection of how the property compares to the industry standard when it comes to price, facilities and services available. It's based on a self-evaluation by the property. Use this rating to help choose your stay! One of our best sellers in Miami! This luxury Miami hotel is in the center of the city’s financial district and offers views of the Miami River and Biscayne Bay. It is eco-friendly and features a full-service marina and waterfront dining at Area 31 restaurant. The spacious guestrooms at Kimpton EPIC Hotel provide views from the floor-to-ceiling windows. Each room features a private balcony and a 55-inch Smart TV with iPhone connectivity. Kimpton EPIC Hotel features a 12000-square foot spa and well-being sanctuary in addition to fitness classes offering everything from barre to core fusion cardio. This pet-friendly hotel also offers a 16th-floor rooftop pool. With live music and artistic installations, on-site LILT Lounge offers a unique bar experience amid a social atmosphere while on-site Zuma restaurant serves modern Japanese cuisine by the waterside. American Airlines Arena and the Port of Miami are both 5 minutes’ drive from the hotel. Miami International Airport is 8.6 mi away. When would you like to stay at Kimpton EPIC Hotel? This room features a balcony with a city view, spa bathtub, and sitting area. This room features a spa bath, iPod docking station and a 55-inch flat-screen TV. A work desk and ironing facilities are also available. This spacious suite features a spa bath, iPod docking station and a 55-inch flat-screen TV. A separate living room, work desk and ironing facilities are also available. Thissuite features a spa bath, iPod docking station and a 55-inch flat-screen TV. A work desk, 2 private balconies and ironing facilities are also available. This quadruple room features a water view and includes a balcony, seating area and spa bath. This quadruple room features a balcony, a smart TV, and a private bathroom with a separate shower and soaking bath. This guestroom includes air conditioning and a private bathroom. 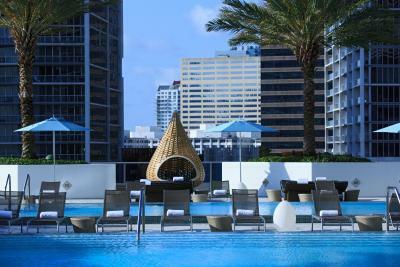 EPIC Hotel is an urban resort in Downtown Miami. Sun-worship poolside, relax at Exhale spa, enjoy cocktails at Lilt Lounge, or dine at Area 31. House Rules Kimpton EPIC Hotel takes special requests – add in the next step! Kimpton EPIC Hotel accepts these cards and reserves the right to temporarily hold an amount prior to arrival. This property serves continental breakfast only on the rates that apply for only 2 guests per room. Breakfast for extra people in a room is not included in the rate. Extra people must pay an additional fee for breakfast. The name on the credit card must match the name on the photo identification and the name on the reservation. See above. Very very disappointing when you calculate over $400 a night. Dirty sofa with stains of unknown origin. 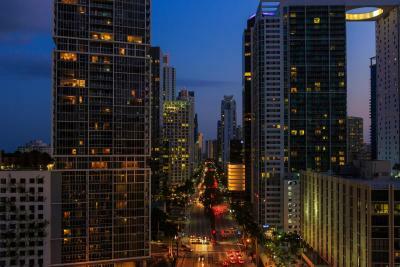 Location over the Brickell Avenue bridge, traffic noise high. The only complaint I would have would be the price of the food. Way too expensive. Had to go off the hotel to get my food and drinks. I like everything about the property! The valet packing is very poor, waiting time over 40 minutes. Staff great. Zuma very good. Room size and views from the room. Some street, HVAC (from neighboring building) and aircraft noise outside the balcony. Food at the Restaurant - Zuma - was fantastic! Staff at check in and out very friendly, knowledgeable, gave me some great tips on getting around the city. I would recommend a stay here. Staff were helpful and made us welcome, I had a text message when we landed from the hotel so I knew there was no problem with my booking, this hotel wasn't the cheapest by any means but you get what you pay for. Tired room in need of refurb shower floor grotty, colour scheme depressing...cushions stained, wooden furniture bashed. had to request coffee maker though this came very quickly.